Every person has dreamed of being the cowboy standing in the middle of street, alone, staring down your enemy, fingers twitching by the side of your gunbelt, looking for the flinch in your adversaries face that will unleash blazing steel from your side...now is your chance...but watch your back ! THE COWBOYS is our game of the Old West. 2 - 10 Cowboys (players) shoot it out in 10 - 60+ minutes. 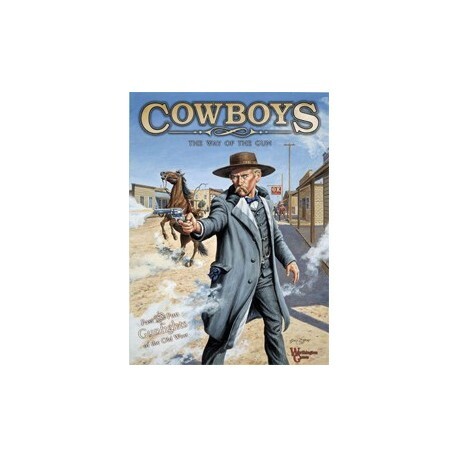 The game features stand-up Cowboy Counters artistically designed with full color artwork by Gary S. Zaboly. There are 26 Historical and Hollywood style scenarios in the game. Six double-sided geomorphic mapboards create the battlegrounds of the Old West. The game rules allow you to pick up and play the game in minutes. The optional rules add chrome but still keeps the game very playable. The "Old West" personalities are there; Wyatt, Doc, Jesse, Billy, and many other legends of the Wild West. Some of the variables include town folk,horses, etc. Bank robberies, cattle rustling, stagecoach holdups, jail breaks, lynch mobs, and many other western actions are depicted. It pits opposing sides against each other, bringing to life the daring and dastardly deeds of heroes and villains when the way of the gun ruled the day. 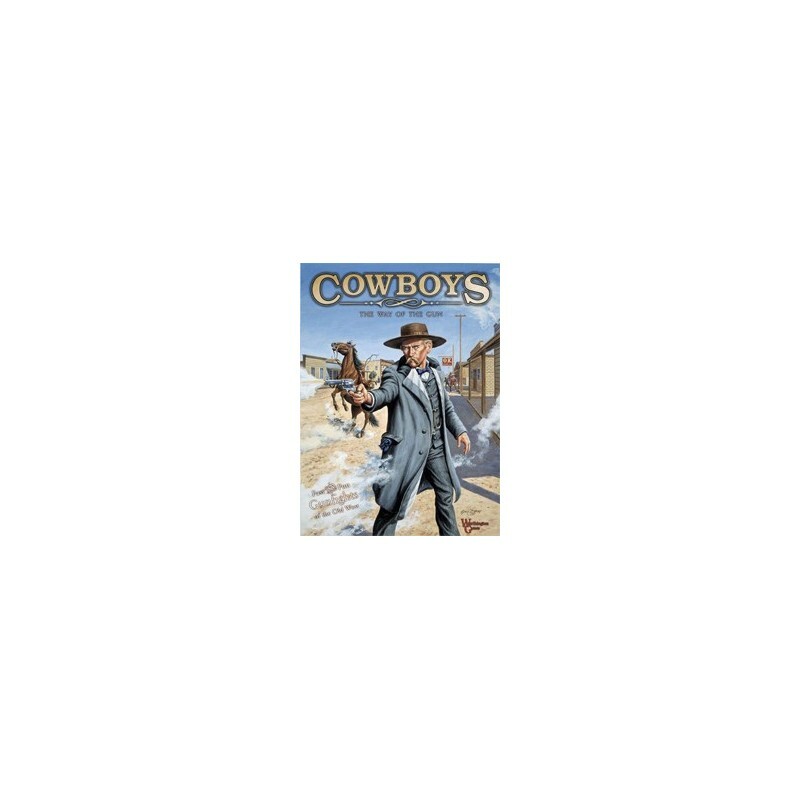 Included are the lawmen, gunfighters, gamblers, and ne'er do wells who knew how to handle themselves during a gunfight. Also the town folk will show up to add a much needed gun to the fight. 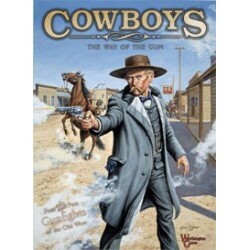 Every person has dreamed of being the cowboy standing in the middle of street, alone, staring down your enemy, fingers twitching by the side of your gun belt, looking for the flinch in your adversaries face that will unleash blazing steel from your side...now is your chance...but watch your back! 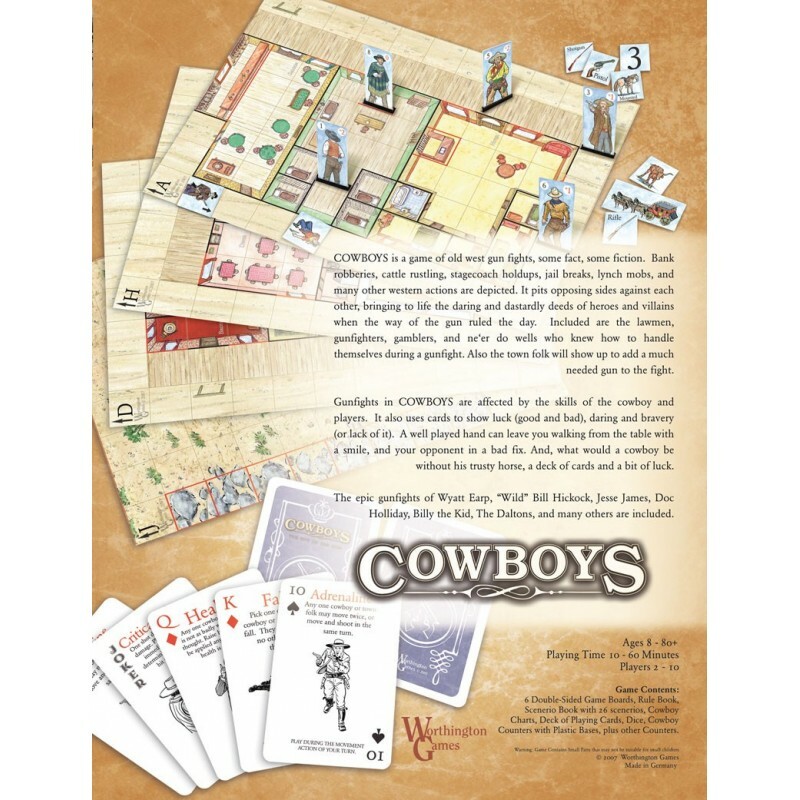 Game includes hard mounted geomorphic map boards, counters, stand-up cowboy counters, plastic bases, dice, box, rules, scenario book, cards, and other game play materials.